The RB-910 is scheduled to EOL. The ReadyBoard 910 is a mid-sized, EPIC-compatible, high quality single-board system, which contains all the component subsystems of a PC/AT PCI motherboard plus the equivalent of up to 4 PCI expansion boards. The ReadyBoard 910 is based on the high-performance, high-integration, IntelR Core? i5 and i7 CPUs, which incorporate multi cores with integrated Northbridge Graphics and Memory Hubs (GMHs), providing high-performance processor cores, memory controllers for up to 16GB of standard DDR3 SODIMM memory, and graphics controllers for VGA, LVDS, and DVI signals driven by the chipset. One of these processors combined with the matching chipset provide the designer a complete integration solution based on the EPIC form factor and Revision 2.0 of the EPIC standard. Each ReadyBoard 910 incorporates an Intel BD82HM65 chipset for the Platform Controller Hub (PCH) function featuring two USB 2.0 ports, two USB 3.0 ports, two SATA 3.0 ports, one SATA 2.0 port dedicated for the SSD, six PCIe x1 ports, one SMBus port, one GPIO port, and one HD audio port. The SMSC Super I/O controller, SCH3114IU-NU, adds legacy I/O functions for PS/2 keyboard and mouse interfaces and two serial port interfaces. 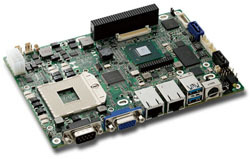 The ReadyBoard 910 also supports two independent Gigabit Ethernet interfaces through PCIe x1 Ports 3 and 4, one PCI-104 interface through PCIe x1 Port 2, and one PCIe Mini Card interface through PCIe x1 Port 6. The ReadyBoard 910 can be expanded through the PCI-104 expansion bus to accept PCI-104 cards that offer compact, self-stacking, modular expandability for additional system functions. The PCI-104 bus only implements the signal set for the PCI bus and is available on the 120-pin (4 rows of 30 pins) expansion bus connector. The PCI bus operates at 33 MHz clock speed. Among the many embedded enhancements on the ReadyBoard 910 that ensure embedded system operation and application versatility are a Watchdog Timer, serial console support, battery-free boot, optional customizable logo screen (see Sales Representative), on-board PCIe Mini Card socket, and ACPI support for sleep states. The ReadyBoard 910 is particularly well suited to embedded applications by meeting the size, power consumption, temperature range, quality, and reliability demands of embedded system applications. It can be stacked with ADLINK MiniModules? or other PCI-104 compliant expansion boards, or it can be used as a powerful computing engine. The ReadyBoard 910 requires only a +5V power supply, however, certain functions such PCI-104, LVDS, fans, and PCIe Mini Card require +12V.